Astronomy in China has a very long history, with historians indicating that the Chinese were the most persistent and accurate observers of celestial phenomena anywhere in the world before the Arabs. Star names later categorized in the twenty-eight mansions have been found on oracle bones unearthed at Anyang, dating back to the middle Shang Dynasty (Chinese Bronze Age), and the mansion system's nucleus seems to have taken shape by the time of the ruler Wu Ding (1339-1281 BC). Detailed records of astronomical observations began during the Warring States period (fourth century BC) and flourished from the Han period onward. Chinese astronomy was equatorial, centered as it was on close observation of circumpolar stars, and was based on different principles from those prevailing in traditional Western astronomy, where heliacal risings and settings of zodiac constellations formed the basic ecliptic framework. The ancient Chinese invented the first planetarium, which was actually made by an emperor. The planetarium was a big enclosed place with stars and constellations on the inside. The person using the planetarium would sit in a chair that was hanging from the top of the enclosed dome. 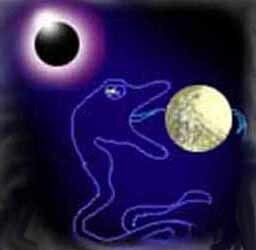 A solar eclipse of 16 June 763 BC mentioned in an Assyrian text is important for the Chronology of the Ancient Orient. By 2300 BC, ancient Chinese astrologers, already had sophisticated observatory buildings, and as early as 2650 BC, Li Shu was writing about astronomy. Observing total solar eclipses was a major element of forecasting the future health and successes of the Emperor, and astrologers were left with the onerous task of trying to anticipate when these events might occur. Failure to get the prediction right, in at least one recorded case in 2300 BC resulted in the beheading of two astrologers. Because the pattern of total solar eclipses is erratic in any specific geographic location, many astrologers no doubt lost their heads. By about 20 BC, surviving documents show that Chinese astrologers understood what caused eclipses, and by 8 BC some predictions of total solar eclipse were made using the 135-month recurrence period. By AD 206 Chinese astrologers could predict solar eclipses by analyzing the Moon's motion. Ancient Chinese astronomy was primarily a government activity. It was the astronomer's role to keep track of the solar, lunar, and planetary motions as well as divine what astronomical phenomena may mean for the ruling emperor. Solar eclipses, infrequent and dramatic, were important enough to be recorded in chronicles and on "oracle" bones. Below are a few translated eclipse records found in the documents of ancient China from various dynasties. In general, the translations give the Roman calendar dating of the event, the Chinese dating, and the observation. Following in parentheses is the record in which the observation is noted. More translated records can be found in the references given below. Unless otherwise noted, the translations below can be found in the book Historical Eclipses and Earth's Rotation by F. Richard Stephenson. "Oracle" bones are pieces of animal bones and tortoise shells inscribed with astronomical observations, that were probably used for divinations. Oracle bones hail from the Shang dynasty (c. 1600 - 1050 BC) and make many references to solar eclipses. The eclipse records are often incomplete, however, and the dating of the bones is not reliable. Eclipse observations from the Chou dynasty and Warring States period (c. 1050-221 BC), and onward, have been reliably dated, and it appears that some astronomers recognized eclipses as naturally occurring phenomena. From the Chou dynasty, 36 solar eclipse observations are recorded in the Ch'un-ch'iu beginning around 720 BC. The Piao and the Shih-chi documents refer to nine solar eclipses from the Warring States period. Records of solar eclipses from the Han dynasty (206 BC - 220 AD) are found primarily in two official histories: the Han-shu and the Hou-han-shu. There are no records of eclipses from the Ch-in dynasty which came just prior to the Han dynasty (221 BC - 206 BC). Accurate eclipse timings can be used to determine the rate of the Earth's rotation. According to Steele and Stephenson, solar eclipse timings can be found from the periods between 600 and 800 AD, 1000 and 1300 AD, and a brief period during the Ming dynasty. These solar eclipse timings are accurate to about 0.4 hours. that dragons were devouring the sun.